Construction kit #40025 Chippendale Sideboard, 1 pc. Construction kit #40038 Queen-Anne table, 1 pc. 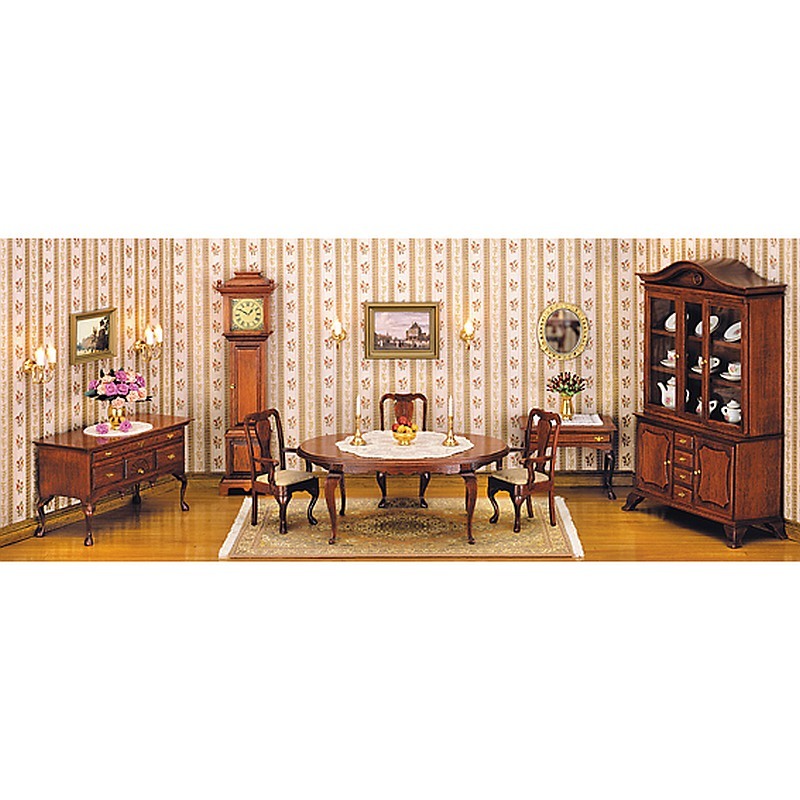 Construction kit #40076 Queen-Anne dining table, 1 pc. Construction kit #40078 Queen-Anne upholstered chairs, 4 pcs. Construction kit #40080 Display case, 1 pc. Construction kit #40083 English hall clock, 1 pc. Various miniatures are also included such as a tea service (#15150), flower vase, candlesticks (#17280), mirror (#19300), picture frames, etc., all of the working materials and 3 sheets of wallpaper (41157). As the ideal space for the "English tea salon", we recommended our new MODULE-BOX (90100), and for uniform lighting, the usage of two indirect lighting bars along with the 5-lamp chandelier with chains (21110) and the 3-lamp chandelier with real glass covers (21320). A correspondingly wide flat strip (70591) is glued to the front glass panel to elegantly conceal the lighting bars. This has the advantage that the lighting bar lies freely after the glass panel is slid on and the light bulbs can be easily replaced as needed.